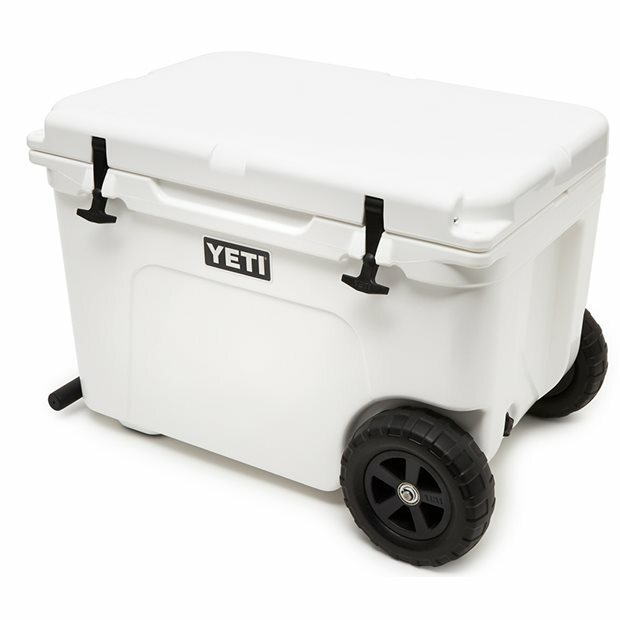 DESCRIPTION YETI introduces their first cooler on wheels, The Tundra Haul. It features 2 nearly-indestructible Neverflat Wheels and a T-Bar Strongarm Handle for the most durable, reliable, and comfortable towing design. Just like its predecessors, nothing was sacrificed in the making of this cold-holding powerhouse. The Tundra Haul is built tough with Rotomolded Construction that is armored to the core. It is equipped with Lipgrip Handles that stay of your way until you need them. And don’t forget the cold-holding power. The Fatwall Design is made with extra thick walls that hold up to two inches of insulation. Permafrost Insulation offers pressure-injected polyurethane foam in the walls and lid to make sure your ice stay frosty and the Coldlock Gasket circles the length of the lid to block out heat and lock in cold. Note: Tundra Haul is not compatible with the dry goods basket.